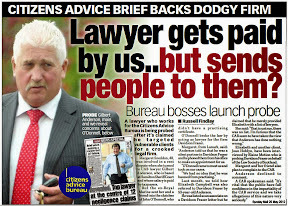 The SLCC’s latest study which is seeking disclosure of information from individual law firms on how solicitors deal with complaints has drawn sharp criticism from the legal profession itself and provoked calls by lawyers lobby groups to boycott the survey after fears were raised that actual complaints data would end up being published by the media as a result of Freedom of Information requests to the SLCC. Consumer Focus Scotland in their previous incarnation as the Scottish Consumer Council conducted several studies & investigations into the notorious difficulties encountered by members of the public who are forced by circumstances to file complaints about their solicitors to the self regulating Law Society of Scotland and ‘independent’ Scottish Legal Complaints Commission. 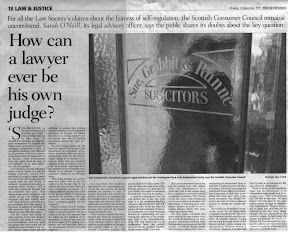 In what is now well over two decades of surveys & investigations by consumer groups & bodies into the complaints processes of Scotland’s legal profession, very little has changed from the 1999 SCC report “Complaints About Solicitors”, with most clients encountering a significant anti-consumer prejudice when making complaints about their solicitors to the legal profession’s in-house closed shop regulators. However, the SLCC has steadfastly refused to monitor individual claims to the Master Policy in spite of being asked by members of the public to do so, and no detectable changes have been made to how the SLCC deals with complaints made against negligent solicitors. 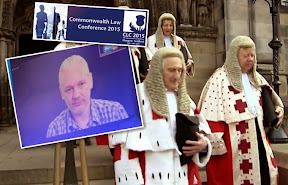 The Scottish Legal Complaints Commission has not released any further statements on the progress of the survey or any response to criticisms it is avoiding Freedom of Information laws by refusing to look at complaints data gathered by it’s contract researchers. As of 1 April 2012 the Legal Ombudsman began collating names of lawyers and law firms subject to complaints resolved by an ombudsman's decision. Any data collected will be made publicly available by the Legal Ombudsman at the end of July 2012 and then subsequently every quarter. Scottish Legal Complaints Commission appoints latest Chief Executive. 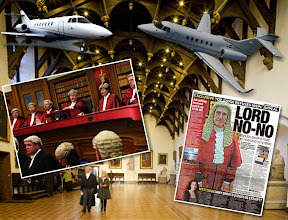 THE Scottish Legal Complaints Commission (SLCC), the quango set up by Holyrood msps and the Law Society of Scotland to ‘independently’ regulate crooked Scottish lawyers yet who’s highly remunerated board members have openly branded members of the public “frequent flyers”, “chancers” and demanded consumer groups be excluded from studies into the effects on clients of rogue lawyers has announced the appointment of it’s latest and now FIFTH in FOUR YEARS Chief Executive, Matthew Vickers. 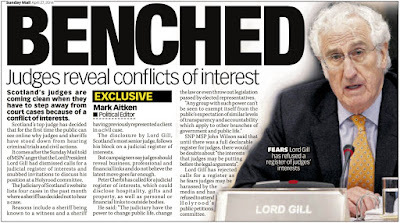 Mr Vickers a former British Consul in the Canary Islands & Madrid, takes up the post on 5 June 2012 replacing Rosemary Agnew who left the legal complaints quango to be Scotland’s new Information Commissioner in charge of Freedom of Information laws. 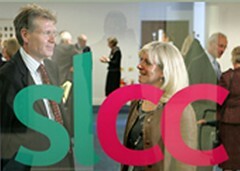 In an announcement on the SLCC’s website, Jane Irvine, Chair of the SLCC, who was recently revealed to have met lawyers accused of professional misconduct in meetings where it had been agreed no records would be kept of discussions, said: "The SLCC is delighted to appoint Matthew as our new Chief Executive Officer. Matthew will bring fresh thinking to the SLCC just as we really start to push our performance for the benefit of all our service users - legal practitioners and consumers. In our search, in keeping with our aspirations for the SLCC, we set our sights high and were delighted to be able to select Matthew from an exceptionally strong field of candidates." Matthew Vickers, who will join the SLCC as Chief Executive Officer on 5 June 2012, said: "Customer service and efficient and effective ways of working have been themes throughout my career, and I hope to help a talented and enthusiastic team build on what the SLCC has already achieved. As the gateway for legal complaints, the SLCC must inspire trust and confidence in the legal complaints system. 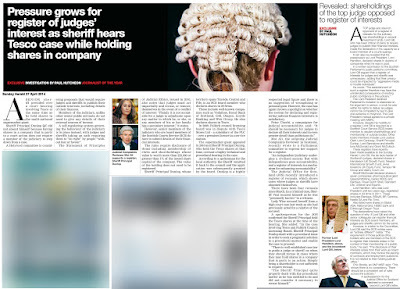 It's vital that consumers and legal practitioners recognise us as impartial, accessible and independent if we're to continue to do so." Matthew is forty years old and originally from Merseyside. Matthew studied Modern History at Merton College, Oxford before a Master's in Industrial Relations at the LSE. Matthew later returned to Oxford for doctorate entitled "Civic Image and Civic Patriotism in Liverpool 1880-1914" and joined Safeway on graduate scheme in 1998 working at Ferry Road store in Edinburgh. Matthew moved to McCurrach UK in 2002, made Board Director in 2004 and later joined the Foreign and Commonwealth Office in 2009. On completing doctoral research on the history of Victorian Liverpool, Matthew joined Safeway where he held head office and regional roles specialising in customer care and customer insight. He later joined McCurrach UK, serving on the Operating Board and taking overall responsibility for in-store execution for AG Barr Scottish and Newcastle. In 2009, Matthew joined the Foreign and Commonwealth Office (FCO) as British Consul in the Canary Islands, subsequently moving to take up the role of Consul in Madrid. Last year he was awarded the Foreign Secretary's Award for Service Delivery recognising his significant contribution to improving the support which the FCO offers to Britons abroad. 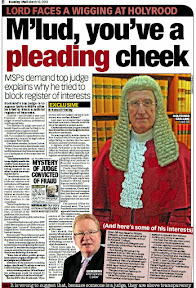 The latest Chief Executive of the beleaguered SLCC, widely viewed as anti-consumer from it’s failure to prosecute or strike off even a single crooked lawyer since 2008 (an even worse record than the Law Society of Scotland) certainly has a task ahead of him to improve the SLCC’s image if Scots consumers are to be able to trust the SLCC to carry out effective regulation of complaints without the usual inherent bias for lawyers. One SLCC insider dubbed Mr Vickers “a visiting fireman” amid hopes by some in the organisation he can repair the law quango’s image & functionality. 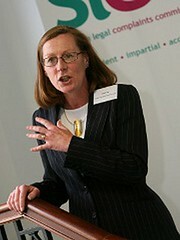 The post of the SLCC’s Chief Executive has seen considerable controversy over the four year period of the hugely expensive yet under achieving law complaints quango which has burned up at least TWO MILLION POUNDS of taxpayers money and taken a further TWELVE MILLION POUNDS from the legal profession in the form of of complaints levies paid by solicitors, which in turn are recouped from hikes (or spurious additions) in legal fees demanded from clients. 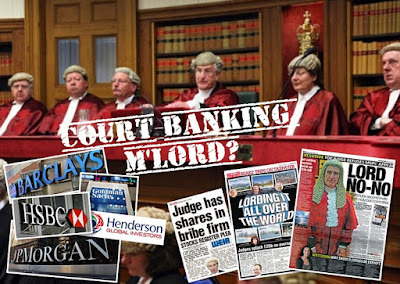 As the Scottish Legal Complaints Commission announced it’s latest Chief Executive, a number of bizarre ‘investigation examples’ & ‘determination examples’ using letters of the alphabet to refer to [crooked’ lawyers and consumers who made complaints about their lawyers have been published on the law quango’s website, in an effort to show the public what to expect from the SLCC. However the ‘examples’ published by the SLCC fail to identify a single solicitor or law firm, in stark contrast to the policy of the Legal Ombudsman for England & Wales to publicly name & shame law firms & lawyers who fail their clients in more fuller & detailed publications of complaints. Complainers are also not identified. 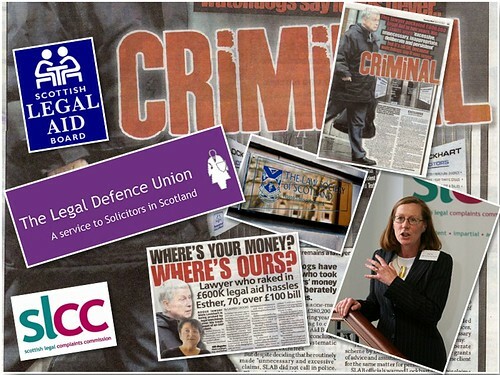 In none of the examples published by the SLCC to-date, some of which are reproduced below, are there any references to any recommendation that a law firm or solicitor should be investigated for prosecution by the Law Society of Scotland & the Scottish Solicitors Discipline Tribunal. All examples featured by the SLCC, appear to show a series of slaps on the wrist for lawyers & law firms who are not required to alert any of their other clients to complaints made against them and poor service they have given to previous clients forced by their predicament to complain to the Scottish Legal Complaints Commission. The Determination Committee considered afresh a wide range of information which included the Firm's file, Mr C's comments, Mr P's comments and the Service Standards. The Determination Committee did not uphold any element of the complaint. Its view was that Mr P had exercised his professional judgement in relation to the representation and saw no evidence that this was improperly done. The Committee understood that it may have appeared odd to Mr C that his ex-wife's solicitor was instructed to provide alternative representation but this was not inadequate professional service. It is standard and acceptable practice for one party's agents to represent both parties where a case like this was calling in regard to a non-contentious matter, and it was appropriate in this case. There was no substance to the complaint about failure to follow instruction. Not only was Mr C was unable to clarify or provide any evidence of all of the instruction he claimed he gave to Mr P but where instruction was given, records demonstrated it was followed. Mr C complained about the service Mr P and his Firm provided in relation to his separation. He complained about the way the Firm advised him on costs and subsequently charged him. He alleged they charged nearly double the verbal quote and that they did not tell him when the costs became higher than the limit he was able to pay, even though they had agreed to. The Firm did not respond to his requests for a breakdown of costs for over ten months, they did not take payments from his debit card even though he instructed them to do so and the amounts they charged him differed between invoices without any explanation as to why. Mr C was also unhappy with the poor communication and delay in dealing with his case. It took five months to draft a document Mr P told him was straightforward, by which time it was out of date. The Firm did not keep him informed or updated as the terms of business letter said they would. Nor did they respond to his complaint about the delay and the fees. At the point Mr C complained to us, the Firm had started to chase him for payment of his fees and although he paid them in full, did not acknowledge receipt. The SLCC investigated this complaint by examining the Firm's files and all the information Mr C sent. We spoke directly with both parties and took into account all they had to say. We found that that Mr C's case was not as straightforward as it appeared to be. There were unavoidable reasons for the delay and although the fees were higher than originally quoted, it was clear the work was both necessary and instructed by Mr C. The SLCC did not uphold the allegations about these aspects of the service. However, it was apparent that neither Mr P nor his Firm kept Mr C informed. Their communication with him was sporadic, did not answer his questions and contained a lot of jargon that he may not have understood easily. There was no evidence they had answered his complaint. 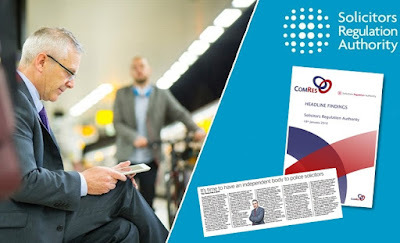 Had they communicated more regularly and effectively with Mr C to help him understand why there were delays and why the matter was more complex than originally thought, they may have avoided the complaint, and would not have caused Mr C the inconvenience of writing to them or of complaining. We reported these findings to both parties and recommended a settlement that they both accepted. The Firm apologised. It also paid Mr C £550 compensation for the distress and inconvenience caused by the poor communication. We did not recommend a rebate of fees because although they were higher that Mr C was expecting, the service and advice provided in relation to his separation were not found to be inadequate. Mr and Mrs C complained about the way Ms P and her Firm dealt with their house purchase. 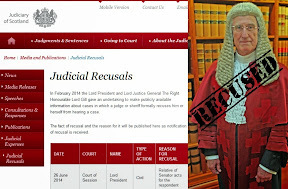 They were unhappy with her alleged failure to settle on the date they were expecting, 21 October 2010 which they agreed the week before in a telephone call. They called the Firm on 20 October to confirm everything was in order and were told by Ms P that she was not expecting to settle until 22 October. She said that settlement could not take place unless a new disposition was issued and delivered to the purchaser's solicitor for the next day. This was quite late in the working day. Mr and Mrs C decided they wanted settlement to take place on 21 October as planned. Ms P prepared a new disposition which was hand-delivered. The settlement took place followed by settlement late afternoon on 21 October. This meant Mr and Mrs C could not complete their move and had to pay their removal company for an extra day. When the SLCC examined the Firm's file and the information that Mr and Mrs C provided, it emerged that the conveyancing was not straightforward. There were problems with the sale of Mr and Mrs C's current property resulting from the completion of remedial works identified by their buyer's survey. We could see that Ms P had raised doubts in her letters about being able to settle on 21 October and had kept Mr and Mrs C informed. Equally, it was evident that she was aware that 21 October was their desired date. The consequence of the uncertainty about the settlement date meant that Ms P was unprepared for settlement on 21 October and as a result settlement was not until late in the afternoon of 21 October. Our view was that the service was adequate and did not breach any Service Standards. We appreciated it was a stressful time for Mr and Mrs C and that they had done everything they could. ; We could also see that the Firm had made strenuous efforts on their behalf and had managed to settle on the day they wanted. We considered very carefully the matter of the extra costs for the removal company, but did not recommend these be compensated as they were not the consequence of inadequate professional service. Although we did not uphold the complaint, our findings and recommendations were accepted by both parties and no further action was taken. 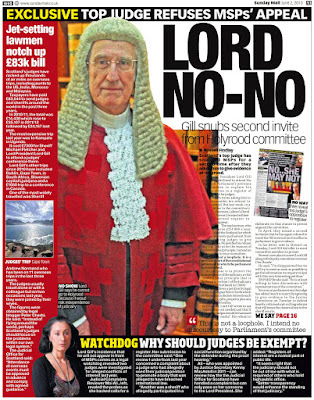 Court of Session's Lord Brodie hears Legal Defence Union boss accused of misconduct in Law Society report. 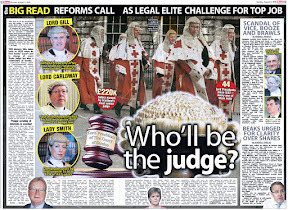 DETAILS of a court case heard in Scotland’s Court of Session have revealed William Macreath aged 60, who is the head of the LEGAL DEFENCE UNION (LDU), a shady lawyer’s lobby group specialising in defending crooked colleagues has been accused of “five findings of inadequate services” and “seven findings of professional misconduct” by an unnamed reporter acting for the Law Society of Scotland. 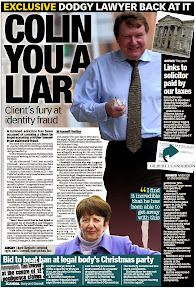 The stinging accusations against the LDU boss, who it was revealed last year had secret meetings with Jane Irvine, Chair of the Scottish Legal Complaints Commission (SLCC) in expensive Edinburgh hotels, are contained in one of four reports carried out by Law Society reporters investigating complaints originally made SEVEN YEARS AGO in 2005 by a fellow solicitor, Miss Norna Crabbe. 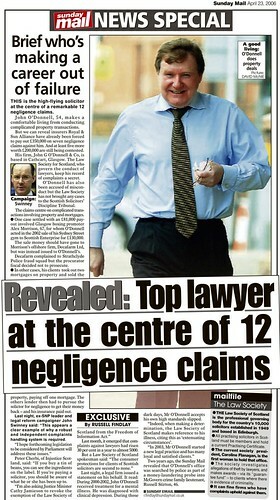 Details of the court case and allegations against Mr Macreath who is also a partner in Glasgow law firm Levy MacRae only came to light after the LDU boss petitioned the Court of Session for a Judicial Review against the Law Society of Scotland which in turn resulted in Miss Crabbe asking leave to enter the process and to lodge answers as additional respondent alongside the Council of the Law Society of Scotland in response to the petition filed by Mr Macreath. Earlier this week, Miss Crabbe’s motion to the court to enable her to enter the case faced bitter opposition from advocate Helen Watts, acting on behalf of Messrs Simpson & Marwick who are representing Mr Macreath. 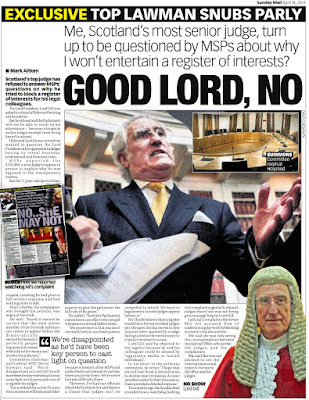 During the debate on the case, the Judge, Lord Brodie who is known not to be a big fan of the media, heard the case had come about after it had taken the Law Society of Scotland no less than four reporters to wade through, investigate and report back on complaints made against Mr Macreath by Miss Crabbe in relation to litigation & legal services provided by Mr Macreath to Miss Crabbe over the dissolution of a firm in which Miss Crabbe had been a partner. 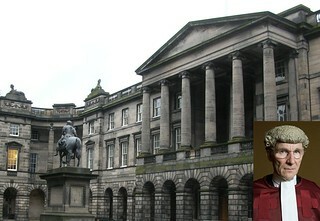 The court was told of how the third reporter who looked into the complaints made against Mr Macreath recommended that all heads of complaint made by Miss Crabbe against the petitioner be dismissed, with the exception of one finding of inadequate professional services upon which the third reporter recommended that no sanction be imposed on the petitioner in respect of that finding. 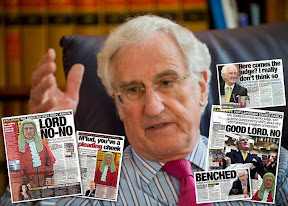 Miss Crabbe subsequently complained about the terms of the 2009 Report conducted by the third reporter and it was by way of response to Miss Crabbe's complaint about the 2009 Report that the respondent made its remit (which the petitioner avers was of a limited nature) to the fourth reporter. In what appears to be a complete reversal of the third reporter’s findings, the fourth reporter reported in terms of the 2011 Report. In the 2011 Report the fourth reporter made five findings of inadequate services against the petitioner and seven findings of professional misconduct. The fourth reporter did not make a finding of inadequate professional services in relation to the one head of the complaint which had been upheld by the third reporter. In response to the allegations, the court heard in Mr Macreath’s pleadings that he made detailed written representations to the respondent about the unfairness of the approach adopted in dealing with Miss Crabbe's complaint which led to the 2011 Report. The petitioner avers that he did not receive a substantive response from the respondents until 10 January 2012 when the respondent wrote to the petitioner advising that it proposed to proceed on the basis of the 2011 Report treating the 2009 Report as a nullity. 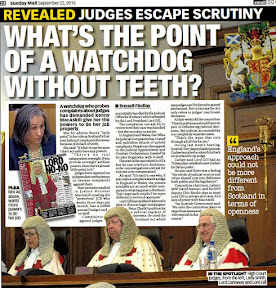 Details published by the court reveal Mr Macreath is seeking an interdict ad interim against the Council of the Law Society of Scotland from taking any procedural step to advance the disposal of the complaint by Miss Crabbe pending resolution of the proceedings; reduction of the Law Society’s decision of 10 January 2012 to set aside the 2009 Report and treat it as a nullity; an order by the Court ordaining the Law Society to set aside the terms of the 2011 Report; and an order by the Court ordaining the Law Society to obtain a supplementary report in terms specified at paragraph 14.4 of the petition. 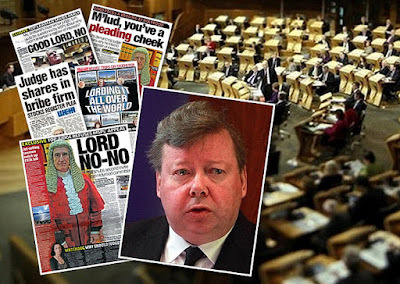 However, after hearing both sides arguments in court, Lord Brodie granted Miss Crabbe’s plea to lodge responses, giving a fourteen day deadline for answers to be received by the court. The full terms of Lord Brodie’s opinion are reprinted below, however it should be noted there does not seem to be any mention of what work if any, the first & second reporters carried out with regard to Miss Crabbe’s complaints. 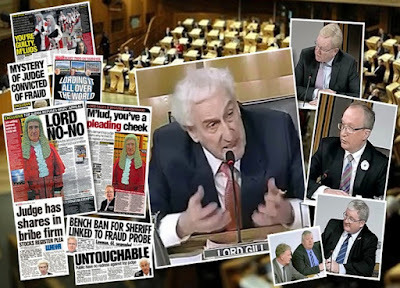 The LEGAL DEFENCE UNION (LDU) is a small, yet powerful organisation which regularly represents crooked lawyers against investigations of client complaints which are carried out by the Law Society of Scotland & the Scottish Legal Complaints Commission (SLCC). 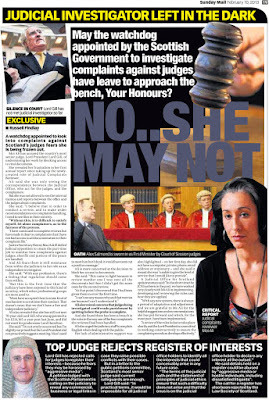 It is now well known the LDU regularly intervene in cases and make submissions to both the Law Society & SLCC on solicitors behalf while the clients who have made the complaints are routinely refused access to the LDU’s submissions, dubbed by some complaints insiders as “more often than not, threatening & intimidatory”. 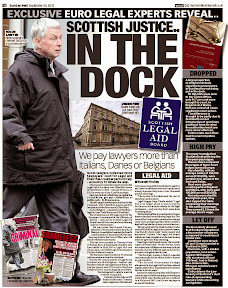 Investigation revealed Legal Defence Union rushed to aid £600K dodgy legal aid claims lawyer. 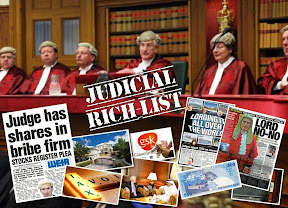 Diary of Injustice conducted an in depth investigation into dealings between the Legal Defence Union and the Scottish Legal Aid Board (SLAB), revealing James McCann, a solicitor acting for the LDU brokered a deal between SLAB and the Law Society to deter action on complaints filed by SLAB against sole practitioner Niels S Lockhart, a solicitor who SLAB accused of making inflated claims for legal aid work after raking in SIX HUNDRED & SEVENTY TWO THOUSAND POUNDS of legal aid funds between April 2002 to March 2005. 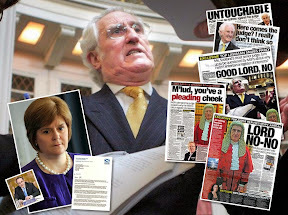 The Scottish Legal Complaints Commission was asked for their reaction over the allegations against Mr Macreath and what impact it may have on any discussions held between the SLCC’s Chair, Jane Irvine and the LDU Boss. No response has been received at time of publication. 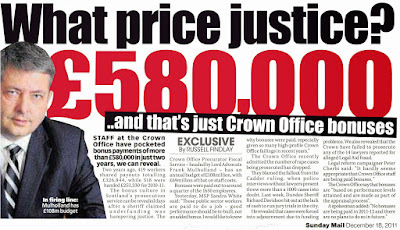 Crown Office staff lacking the usual big bonus payouts have turned to seizing more of crooks cash. 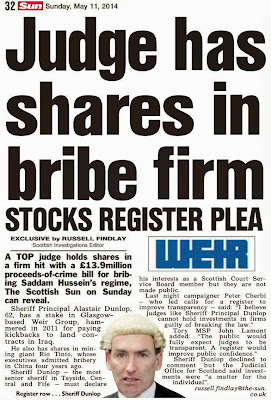 WHILE Scotland’s Crown Office & Procurator Fiscal Service (COPFS) battle headline after headline of collapsed prosecutions & failed investigations, allegations of corruption, evidence fiddling, racism, professional bias and poor value for money over it’s near ONE HUNDRED MILLION POUND administration & wages cost, a glimmer of light has emerged in it’s efforts to raise the amounts of cash ‘seized’ from crooks in the last financial year to around £10.5 million, according to figures announced yesterday by the Solicitor General. with £7 million coming from convicted drug dealers, money launderers and fraudsters while the Civil Recovery Unit claims to have recovered over £3.5 million during the same period. In announcement from the Crown Office reporting this year's POCA figures, Lesley Thomson, the Solicitor General said : "Taking over £10.5 million from criminals is another great achievement by our dedicated Proceeds of Crime teams. "Just as important as the sum recovered is the disruption caused to individual criminals and serious and organised crime groups in Scotland. "Depriving criminals of their money and assets can significantly disrupt their activities, prevent them from re-investing their profits, and make it difficult for them to carry out their criminal enterprises. When the money and assets go so does the status and power. 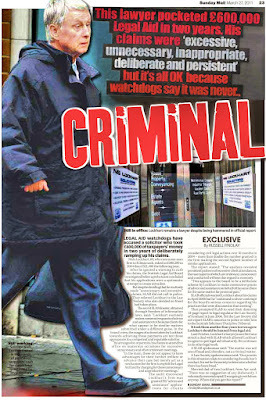 The Solicitor General continued : "There is no place in Scotland for those who want a lifestyle funded by crime. We will continue to work closely with law enforcement agencies to use Proceeds of Crime laws to make Scotland an increasingly hostile place for these criminals. "I also welcome today's publication of the Civil Recovery Unit's second Annual Report which provides further information about its activities over the past year." 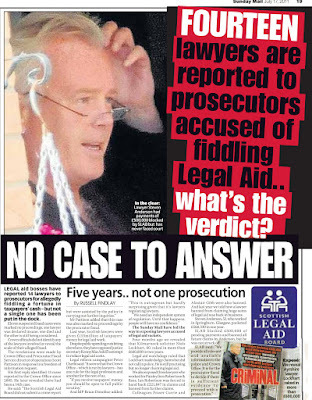 Campaigners for legal reform have serious doubts over the credibility of Crown Office claims they pursue those who profit from criminal activities, pointing out that in cases where solicitors have financially ruined their clients and when matters were reported to the Crown Office, charges were dropped because of a perceived bias that Scotland’s prosecutors were refusing to prosecute their colleagues in the legal profession. 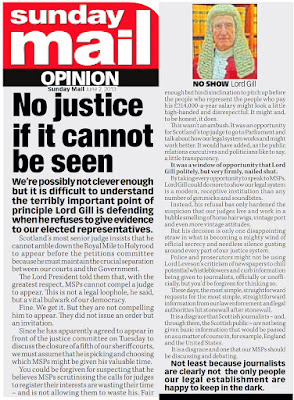 In one recent case reported by Diary of Injustice & the Sunday Mail newspaper, a lawyer who was the subject of reports to the Crown Office, ‘moved escaped to Italy’ while the Law Society of Scotland dithered over taking further action. 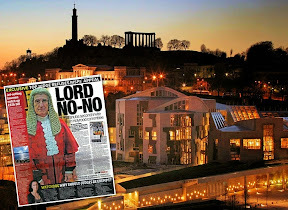 It later transpired the Crown Office had REFUSED to prosecute the lawyer even though matters had been reported to it’s Procurator Fiscal in Stirling. 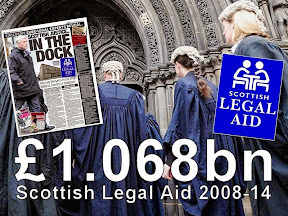 Other than the almost accidental recovery of funds from now deceased solicitor James Muir, who stole a staggering 1.8 million pounds of legal aid from right under the noses of the Scottish Legal Aid Board, officials were unwilling to give figures for the remaining 13 solicitors apparently successful theft of taxpayer funded legal aid. Lindsey Miller, Head of the Serious and Organised Crime Division (SOCD) and the COPFS POCA Champion, said : “The Proceeds of Crime Act is a powerful tool in our armoury in the fight against crime in Scotland. We continue to make maximum use of the legislation to deprive criminals of money and assets. We target people who make money from all types of crime, from serious and organised criminals engaged in money laundering and drug dealing, to individuals committing tax and benefit fraud and immigration offences. We have also applied to the court in a number of cases this year to have administrators appointed to take control of houses where accused have been unable or unwilling to sell them to pay the confiscation order. 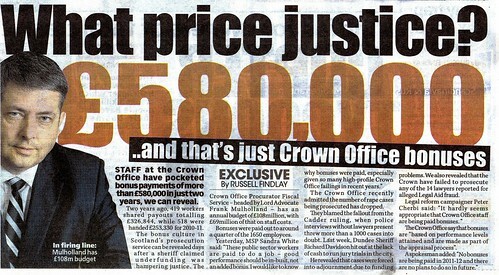 This sends a strong message that the Crown will not tolerate delay and prevarication in the payment of an order. Our priority is disrupting and dismantling criminal enterprises, and we will continue to work with the police, SCDEA, HMRC and DWP to achieve this aim." 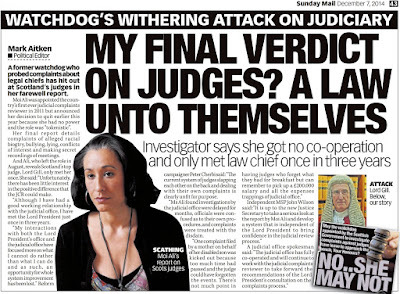 However, Mr Millar and the Crown Office have not answered questions over how much was seized from a Scottish Judge who was charged with Benefits Cheating, and is understood to have remained on the judiciary. 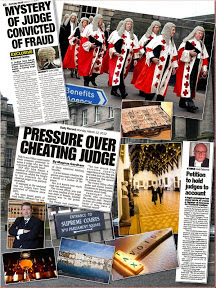 In the case of the Benefits Cheat judge, reported by Diary of Injustice here : ALL THE LORD PRESIDENT’S MEN : Benefits cheats, drunk drivers & tax dodgers, yet identities of convicted Scottish judges to remain secret for now the Crown Office protected their identity and refused to disclose any further details about the case, even where it was being held, despite COPFS staff regularly putting out Press Releases naming & shaming other benefits cheats. 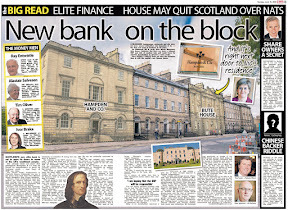 The Crown Office have also still to answer questions over why no confiscation orders have been served on a solicitor, recently reported in the media to have committed mortgage fraud to obtain properties in Edinburgh. 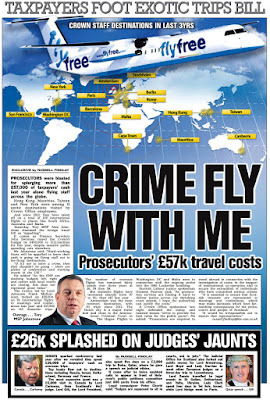 Cabinet Secretary for Justice Kenny MacAskill said : "I welcome this excellent work by police and prosecutors, seizing millions cracking down on gangsters and their ill-gotten gains. Criminals don't contribute to our communities, they live off them and serious organised crime has an impact on everyone in Scotland, harming communities and legitimate businesses through drugs, extortion and counterfeit goods. "That is exactly why cash seized under the Proceeds of Crime Act should be used to benefit communities which have suffered from criminal acts. "Our CashBack for Communities programme invests crooks' cash in building better, safer, stronger communities, improving facilities, taking young people off the streets and putting them on a positive path. We have invested over £45m in providing opportunities for some 600,000 young people to take part in hundreds of thousands of free sports and cultural activities since CashBack began in 2007. The Justice Secretary continued : "Last year amendments were made to the Proceeds of Crime Act to provide law enforcement agencies with additional powers to target a wider range of criminals and criminal conduct. We are continuing to look at other ways to refine the Act to make it even more effective, and we are working closely with the Home Office to do so. We have also allocated approximately £2 million funding for financial investigators in the police and the Crown Office, to ensure even more criminals are targeted." The amount recovered by the Crown Office and Procurator Fiscal Service and the Civil Recovery Unit in the last 12 months brings the total secured since the commencement of the Proceeds of Crime Act (POCA) in 2003 to over £69 million, which it is claimed has been put to the Scottish Consolidated Fund to be reinvested in Scottish communities via the CashBack for Communities programme. 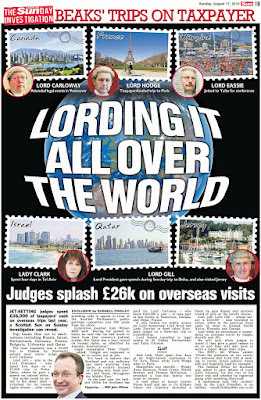 A regular court observer told Diary of Injustice earlier today : “This now annual show from the Crown Office seems more like a pitch for increased salaries or the return of lavish bonus payments”. 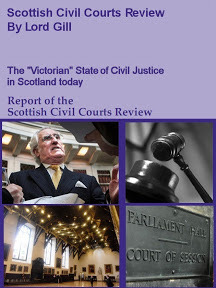 The findings of the report will echo with many members of the public who have asked the Justice Committee to consider issues of grave importance concerning many aspects of Scots law only to be rebuked by a divisive, prejudiced & at times, flippant group of politicians, who appear to have little regard for the inclusive Human Rights of all of Scotland. The report calls for the Scottish Parliament to establish a separate Human Rights Committee because the current committee system has failed to adequately consider human rights issues. 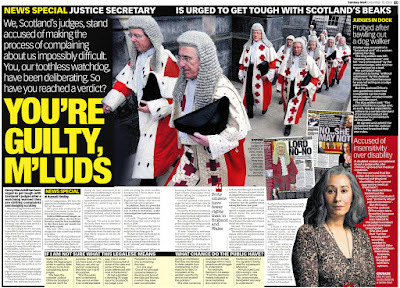 That view was endorsed by Shabnum Mustapha, Director of Amnesty International Scotland : "Amnesty International welcomes the findings of the report which has cast a light on some of the missed opportunities to raise human rights as part of Scottish Parliamentary scrutiny of legislation. We urge the Scottish Parliament to look at how human rights considerations can be better embedded in the work of the Parliament." 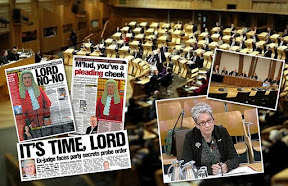 It is a matter of record that since it came into existence in 1999, the Scottish Parliament’s Justice Committee has never once passed a pro-consumer reform or positively considered a public petition seeking to clean up Scotland’s “Victorian” justice system or reform key areas such as regulation of Scotland’s legal profession or deal with issues relating to Human Rights of clients & consumers against the vested interests of those in the legal establishment. 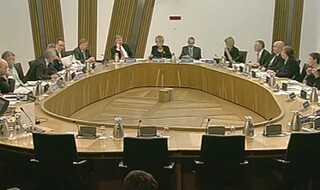 Constituents of MSPs have reported issues over the years to Diary of Injustice where politicians from all parties have failed abysmally to publicly push issues of Human Rights in the Scottish Parliament while on the other hand, being ever happy to issue congratulatory appreciations & events for some professions accused of serial breaches of mounting numbers of constituents Human Rights. Scottish Legal Complaints Commission says it will avoid FOI requests by stashing lawyers dirty complaints info with researchers. 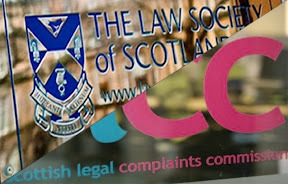 THE Scottish Legal Complaints Commission (SLCC) has responded to calls from a representative body & lobby group for lawyers to boycott a research project into complaints against Scottish solicitors, by assuring the legal profession that any data collected from law firms over how they deal with complaints from clients will AVOID Freedom of Information legislation (FOI) because the data gathered ‘will be held confidentially by a third party’ (in this case, a commercial firm of pollsters) and thus not subject to FOI requirements of disclosure. 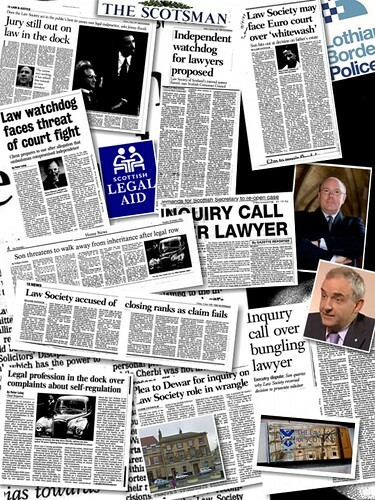 The statement from the SLCC has been widely taken to mean it has signalled to the Scottish Law Agents Society that it’s plans for how the research is gathered and by whom, will deter any leakage of the complaints data to the media or to journalists, individuals or other solicitors making Freedom of Information requests for full disclosure of the research and how it will eventually arrive at any conclusions. 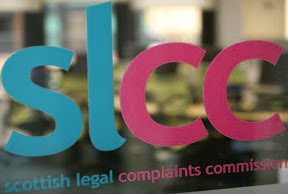 SLAS went on to list 10 points concerning the SLCC’s complaints research project, among them suggesting a delaying action, and also advising member solicitors they had no obligation to hand over complaints information to the SLCC. 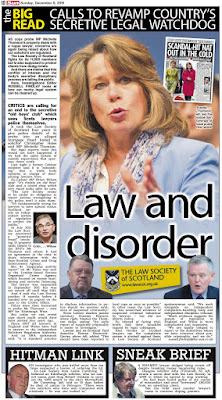 While Jane Irvine remains Chair of the Scottish Legal Complaints Commission, Rosemary Agnew has now left her position as the SLCC’s Chief Executive, replacing Kevin Dunion as Scotland’s new Information Commissioner, which was reported by Diary of Injustice earlier this year, here : SHHH HAPPENED : Scotland’s new Information Commissioner to be Legal Complaints CEO Rosemary Agnew, rebuked FIVE TIMES for being ANTI-FOI. It is of course very difficult to have confidence in public bodies or regulators who are required to comply with Freedom of Information legislation to take such overt steps to ensure important information such as how solicitors deal with complaints is withheld from the public by using what can only be described as unfair and foul means to inhibit transparency & accountability. However, Diary of Injustice will follow this research project and report issues & developments relating to it in the public interest. Allowing ‘third parties’ to collect, collate or hold data on behalf of another is a popular device used by many public bodies including most Scottish Government departments, local authorities. 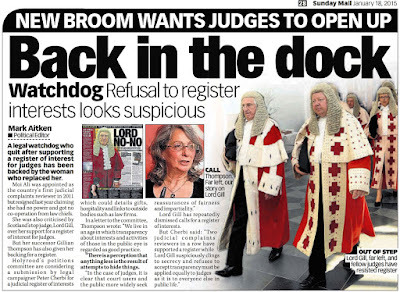 The tactic is also commonly used throughout NHS Scotland, Scottish Water, environmental regulators, most Ombudsmen, the Scottish Parliament, and throughout the justice sector including the Scottish Court Service right up to even the Lord President’s Office in an effort to avoid information falling into public hands via FOI requests using exemptions under Section 3(2)(a)(i) the Freedom of Information (Scotland) Act 2002, where data held by a third party on behalf of another is usually exempt from disclosure. 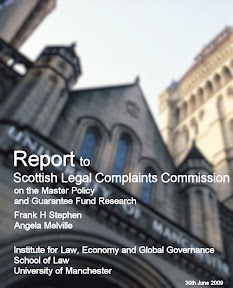 Scottish Legal Complaints Commission commissions more research on complaints against solicitors. FOURTEEN MILLION POUNDS and FOUR YEARS LATER, with little to show for it in the way of struck-off ‘crooked lawyers’ or clients happy their complaints were fully resolved or fully compensated for their losses, the Scottish Legal Complaints Commission (SLCC) has announced it is to embark on YET ANOTHER round of research into how Scottish solicitors ‘deal with complaints’ and ‘the subject of those complaints’ with the commissioning of a new research project, this time being handled by TNS Research International TNS-BMRB for an as yet undisclosed sum. The research is to be conduced via telephone interviews between TNS Research and law firms, although there is apparently no obligation on solicitors to participate. Clients & consumers WILL NOT be asked for their input in the SLCC’s latest research. 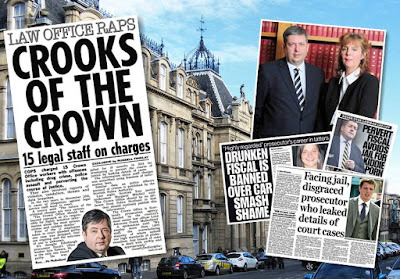 Diary of Injustice recently reported on another SLCC research project into how the Law Society of Scotland handled conduct complaints, here : Protection Racket : SLCC’s ‘whitewash’ investigation of Law Society of Scotland’s conduct complaint process ends in failure to publish full report. However, the SLCC has so far refused to publish its full findings, limiting published information to a brief mention on it’s website. 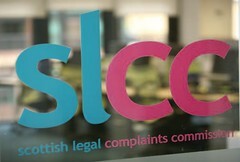 Consumers of legal services in Scotland should not expect any improvement in how the SLCC address client complaints after the close of this research, as no improvements to complaints handling at the SLCC have taken place since October 2008 in spite of a number of costly research projects undertaken by the notoriously anti-client legal complaints watchdog whose board members branded financially ruined clients as “frequent flyers” and “chancers”. As part of its oversight role the SLCC monitors complaints and identifies trends in practice, in relation to how practitioners deal with complaints and the subject of those complaints. This includes undertaking research. 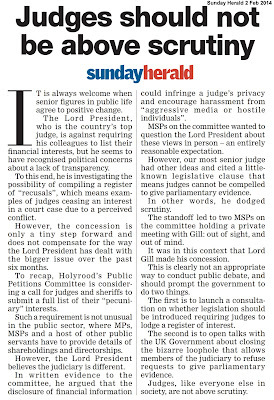 The latest research the SLCC is carrying out is into complaints made to, and dealt with, by the legal profession in Scotland. whether the number and types of transactions carried out by practitioners have any correlation to numbers of complaints received by the SLCC. from whom complaints originate (e.g. from clients or other third parties). For CRMs, the research will be conducted via a telephone interview, which should take an average of 7 - 10 minutes. A data sheet will be emailed in advance of the interview to allow CRMs time to retrieve records and to use that information as an aide memoire during the interview. Advocates will be sent questionnaires to complete and return by post. The SLCC aims to collate information about general complaint handling and expertise employed by those who deal with complaints, and to identify whether there are any unmet training needs. the level, frequency and type of training (either internally or externally) which they have received regarding complaint handling, how to improve services to prevent/avoid complaints and client care, and how this knowledge and training is disseminated to employees. The telephone interviews will be carried out during the first few weeks of May 2012. Advocates should receive their information pack in the first week of May. Once all data has been obtained from the telephone interviews, the information will be collated, scrutinised and a report prepared by TNS-BMRB. The SLCC will publish a report on its research in due course. The participation of practitioners is critical to the success of this research and to enabling the SLCC to provide advice, guidance and support in relation to complaints handling in the future which adds value to and reduces costs to the profession. Please refer also to the SLCC Strategy and Corporate Plan and the SLCC Operational Plan. 1. The notice given by SLCC of this enquiry is insufficient to enable the solicitors’ profession to give collegiate consideration to and to make a considered decision upon the very important issue as to whether or not this sensitive information should be disclosed. 2. The cost of this exercise has to be borne by the solicitors’ profession and no information has been provided as to whether that cost has been estimated and as to whether the exercise will be cost effective. 3. No information is given as to whether or how SLCC has satisfied itself that this exercise falls within its statutory remit and its entitlement to expose solicitors to these costs. 3. The SLCC request does not advise as to whether or not there is any obligation on the part of solicitors to provide this information. 4. Information held by solicitors is private whereas information held by SLCC is subject to Freedom of Information enquiry, disclosure and publication. 5. 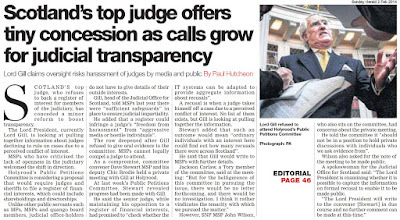 Law Society officials recommend that firms disclose this information to SLCC. 6. 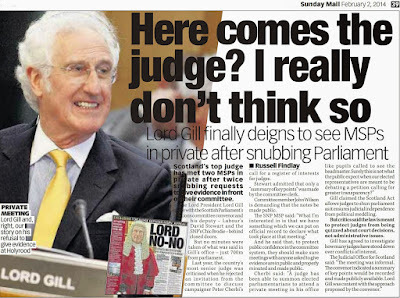 Solicitors do not have any obligation to disclose this information to SLCC. 7. A better option might be for the information to be gathered within the profession where it would remain confidential and beyond the scope of Freedom of Information enquiry and only the conclusions be transmitted to SLCC. 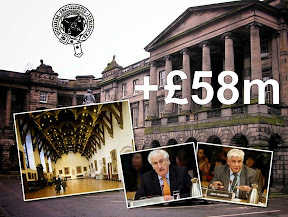 This might be achieved through the faculty structure or through the Scottish Law Agents Society. 8. 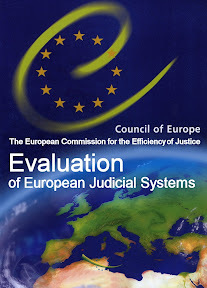 Any research carried out at this stage might helpfully include enquiry into the extent to which the current complaints system accommodates abuse of process by persons who are dissatisfied with proper legal findings 9. The best initial response to this enquiry might be to ask for a further period of time to enable the foregoing issues to be considered and resolved.